About a month ago, after Donald Trump won the South Carolina primary and all of its delegates, we headlined a piece “The Hour is Growing Late to Stop Trump.” Well, the hour has grown later, and we have to ask the question: Has Trump been stopped? Certainly not. And a look ahead at the remaining contests calls into question the ability of the other candidates, Ted Cruz and John Kasich, to prevent him from winning the requisite number of delegates to clinch or come close to clinching the Republican nomination. The magic number is 1,237 delegates, and our own rough calculations show Trump just getting over the hump with 1,239. But that involves Trump winning the lion’s share of the delegates in places as diverse as Wisconsin, New York, Indiana, West Virginia, New Jersey, and California. Table 1 shows these projections, which represent our best guess as to the state of the race right now. Note: “Other” is made up of delegates committed to candidates who have now exited the race, expressly uncommitted delegates, and delegates who will remain technically unbound. These projections are based off a few different factors, such as racial/ethnic demographics, voting history, religious populations, and regional primary voting so far, where available. The post-March 22 delegate starting point is based on The GreenPapers’ calculations. In Wisconsin, Trump may benefit from a Cruz-Kasich split and also may hold the advantage in a number of congressional districts that have lower percentages of college graduates and lower median incomes. We see Kasich potentially winning a couple of districts with higher median incomes that performed strongly for Romney in the 2012 GOP primary. We also handed Cruz the heavily Republican Fifth District, as he has performed better among stalwart conservatives, and the Sixth District next door. For upcoming Northeastern primaries, we used the primary vote in Massachusetts, New Hampshire, and Vermont as a marker. We averaged the three candidates’ vote percentages from those states, then took the remaining vote (for the withdrawn candidates) and apportioned 50% of it to Kasich and 25% to both Cruz and Trump, resulting in Trump 47.5%, Kasich 35.0%, and Cruz 17.5%. In part, this was to see what would happen if Trump fell short of a majority in primaries outside of his home state of New York. In Connecticut, we said Trump would win every congressional district, but that Kasich would pick up six delegates via the state’s proportional method for allocating statewide delegates. Next door in Rhode Island, the heavily proportional statewide and district delegates work out to Trump winning eight of the 19 delegates in the Ocean State. In New York, we figured that Trump would get a slight home-state bump to win a majority statewide, and we also gave him a majority in about half the state’s districts, keeping him under in 14 seats to give Kasich 14 delegates from the Empire State. In Delaware, any Trump plurality would earn him all 16 delegates, which we foresee as likely in the First State. And in Pennsylvania, Kasich may give Trump a run for his money and do better than 35%, but we still see Trump as a slight favorite to win the 17 statewide delegates up for grabs on April 26. Moving to May, we again looked at individual district data to help forge a projection in Indiana. With Trump’s success in Kentucky and the Appalachian parts of lower Ohio, we see him having the edge in most of the state’s four more southern districts. We also think it’s possible he can win the First District as it holds some similarities to districts in Illinois where his delegates found success. We handed Kasich the highly-educated suburban Fifth District, as well as the Third, which borders northern Ohio, and we gave Cruz the Second and Fourth Districts. On May 10, West Virginia, could very likely wind up being a winner-take-all state for Trump, which is how we projected it in this scenario. Considering his success in other parts of the Great Plains, we gave Cruz the winner-take-all state of Nebraska that same day. The Pacific Northwest is harder to gauge, so we gave Trump narrow wins at 39% statewide in proportional Oregon and Washington, with Cruz and Kasich defeating Trump in a few congressional districts in the Evergreen State. Trump could very well win more than 40% in those states — or dip lower than we are projecting. The June 7 contests push Trump over the top. We gave Cruz winner-take-all statewide wins in Montana and South Dakota, but that would be insufficient to hold back Trump. Based off an average of the Arizona and Texas primary vote, New Mexico would narrowly go to Trump, though the proportional system in the Land of Enchantment would award both Cruz and Trump 10 delegates (and Kasich four). But to reach 1,237 delegates, California is the key for Trump. Looking at district demographics, party registration, and GOP performance in the state’s 2014 all-party gubernatorial primary (looking at Republicans Neel Kashkari and Tim Donnelly), we ended up giving Trump the statewide win and the advantage in 32 congressional districts. Cruz won 18 districts and Kasich won three. Will reality work out exactly like this? Surely not. Still, readers can refer back to this table throughout the primary season and track Trump’s progress. If he’s matching or exceeding these projections, he’s on his way. If he’s falling short, the chances of a contested convention rise. 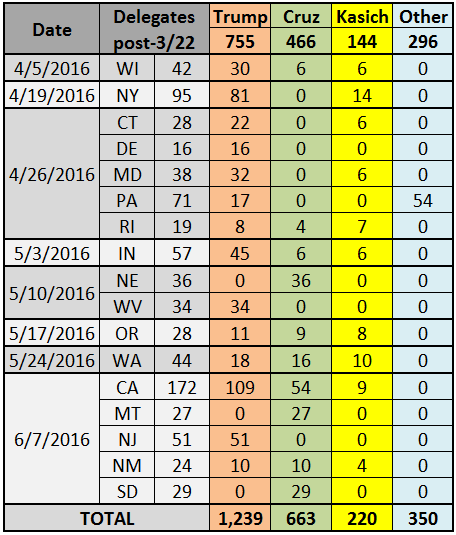 What is clear is that Trump cannot pass the threshold until the June 7 contests are completed. Despite Trump’s growing lead, there may be just enough time for Cruz and/or Kasich to improve their standing and slow down Trump — to keep him enough below the magic number so that he may not be able to coax enough uncommitted delegates into his column for a first-ballot victory. Few would disagree that the anti-Trump forces have the tougher task at this stage of the nominating battle. We realize that this is primarily a math game: Trump either gets to 1,237, or he doesn’t, and in the latter instance either the contest is resolved in the six weeks between the end of the primaries and the opening of the convention, or it goes all the way to the convention and perhaps to multiple ballots, something that hasn’t happened in most people’s lifetimes (1948 saw the GOP’s last multi-ballot convention). But it’s not entirely a math game. It’s also a perception game. If Trump finishes, say, less than 100 delegates short, but he is still comfortably leading national polls of Republicans and wins statewide victories in places like California and New Jersey on the final day of voting (June 7), it’s hard to see how, practically, he wouldn’t be the nominee. Trump would have far more delegates than his rivals, and he would also be heading into the pre-convention period with major statewide victories. Only if Trump finishes 100 or more delegates short does the contested convention become a more prominent possibility. As we’ve previously stressed, there are a small number of unpledged delegates as well as delegates from other candidates that Trump may or may not able to win over in the interim from June 7 through the opening of the convention on July 18. We are starting to get the distinct sense that many Republicans, including some in leadership, may not have the stomach to fight Trump all the way to the convention. As some Republicans put it to us earlier this week, they prefer the Twitter hashtag #NeverClinton rather than #NeverTrump. In other words, they’d rather the party unify behind Trump than allow Hillary Clinton to be president. Rallying behind the polarizing Trump may very well deliver the White House to Clinton anyway, though, and there is a real possibility that a credible third-party anti-Trump Republican will emerge at some point. As this cycle has demonstrated anew, however, a lot can change. The barbaric attacks in Belgium on Tuesday hammer home that we don’t know what the future holds. At this point, we don’t expect the attacks to change the race all that much. The Paris attacks in November and Trump’s later proposal to temporarily ban Muslims from entering the country have likely strengthened his prospects, and Trump has been beating the drum for waterboarding in the two days since Brussels. We doubt there will be much outcry from GOP voters over Cruz’s post-Belgium plan to more heavily police Muslim neighborhoods, either, whatever one might think of it. For anti-Trump forces, the urgent necessity of the moment is that Cruz and/or Kasich need to start pulling upsets against Trump and blunting his delegate edge if they are to have a realistic chance to defeat him. That starts in Wisconsin, where we begin our tour of the final 17 contests in the Republican race. Mathematically, Trump still has a long way to go to clinch a majority of delegates, but Wisconsin could be a key state for him. If he can win most or even all of the state’s delegates in the next contest in the race, it will set him up nicely for the Northeastern states that vote later in April. However, Trump has shown signs of weakness in the Badger State. Craig Gilbert of the Milwaukee Journal Sentinel analyzed months of polling from the respected Marquette Law School Poll and found that Trump’s favorability was much better among Republicans in the sparsely-populated northern part of the state and much worse in Milwaukee County and its surrounding counties, which could cast about a third of the total GOP votes on April 5. So maybe Trump does really well in Wisconsin’s three, large northern congressional districts while the other five are more competitive. Here’s where the Cruz-Kasich split could really help Trump: It’s easy to imagine the two non-Trumps splitting about 60%-65% of the vote, allowing Trump to win with 35% to 40% and to capture most of the delegates. But a new poll from Emerson College showed Cruz ahead of Trump 36%-35%, suggesting that the Texas senator could be the man to beat Trump in Wisconsin. We will see if further polls show a favorable trend for Cruz, who will continue to compete with Kasich to be the preferred anti-Trump candidate in Wisconsin and elsewhere. Allocation method: For CD delegates: If at least two candidates win 20% in a district, the winner receives two delegates, second-place receives one. If a candidate wins a majority or only one candidate wins at least 20%, the winning candidate receives all three delegates from that district. For statewide delegates: If a candidate wins a majority of the statewide vote, the winning candidate receives all 14 delegates. Otherwise, proportional allocation with a 20% threshold to receive delegates. New York is a tremendous prize, and Trump seems well ahead in his home state: An average of two recent polls put him over 50%. And that’s crucial, both statewide and by congressional district. There’s little reason to think that either Cruz or Kasich can overtake Trump statewide, but perhaps they can halt his advance in certain places. The benchmark for whether Trump has a good performance in New York is probably whether he gets 75% of the delegates or not. Allocation method: Winner-take-all for CD delegates (3 per CD), proportional allocation of statewide delegates (20% threshold) with an overall winner-take-all trigger for all 28 delegates if a candidate wins a majority of the statewide vote. The New York results may tell us quite a bit about Connecticut. One could imagine Kasich doing well in some wealthier Nutmeg State parts of the greater New York City area, which might translate into a decent performance in Connecticut’s very wealthy Fourth District, which has one of the highest median incomes of any congressional district in the country. But still, Trump has to be the statewide favorite. Given his northeastern performance so far, Trump’s losing Delaware would be a considerable surprise. An early March survey showed Trump leading Cruz 34%-25%, and the real estate magnate is probably the favorite. With congressional districts in mind, Trump is the favorite in the Sixth District, which contains the rural, Appalachian panhandle, though it runs all the way down into suburban Montgomery County. It’s possible that the more highly-educated Old Line State electorate (56% college graduate in 2012) will be a problem for Trump, but the largely somewhat conservative or moderate nature of it (70% combined in 2012) should more than balance that. However, there will be places of strength for Cruz and Kasich, too. Remember how poorly Trump did in Northern Virginia and Washington, D.C.? One would expect the Maryland parts of Greater D.C. to also be resistant to his candidacy. However, the way the districts are drawn — the D.C. suburbs are balkanized among several different districts by a Democratic gerrymander — might blunt the impact of the anti-Trump vote on the congressional district level. Allocation method: Winner-take-all statewide for at-large and automatic delegates. Three delegates are elected separately from each congressional district; they are named on the ballot individually and elected in what is called a “loophole primary.” However, individually elected delegates do not have a presidential preference listed by their name on the ballot, leaving all 54 of them officially unbound. The Keystone State has a very unusual system — mainly, a throwback to the days when the party bosses made the decisions and average voters in a primary were merely participating in a “beauty contest.” In previous primaries, Pennsylvania Republicans did not technically bind any delegates by primary election results. The statewide vote was purely advisory in nature, and the district delegates directly elected on the ballot were always unbound because no presidential preference accompanied the names of the individually-named delegate candidates. With the new national GOP rules requiring presidential preference votes to be binding, the statewide delegates are now bound by the overall primary result. However, the antiquated unbound district delegates will remain a part of the Keystone State’s process, meaning that only 17 of the state’s 71 delegates will be officially allocated by the result. Embarrassingly, Kasich barely qualified for the ballot here. Considering it’s his birthplace and borders the state he governs, Kasich must hope to have a shot at winning the statewide vote. To do so, he’ll probably need to perform strongly in the western reaches of the state, particularly around Pittsburgh, while also doing well in the Philadelphia collar counties. Trump and Cruz may be stronger in the rest of the state, what is sometimes denoted as “Pennsyltucky.” Given his relative strength in more Northeastern states so far, Trump will surely be in the running to win the Keystone State’s 17 statewide delegates. Additionally, to the extent that Trump fared decently in Ohio, it was by winning 29 of the state’s 32 Appalachian counties. Much of western Pennsylvania is also part of Appalachia, which complicates Kasich’s path. Allocation method: Proportional allocation by statewide and district vote (10% threshold in both). But for CD delegates, if three candidates win at least 10%, each candidate receives one delegate; if one candidate wins more than two-thirds of the CD district vote, that candidate receives at least two delegates. Trump won 49% of the vote in Massachusetts on Super Tuesday, which has been his best performance in any state so far. Massachusetts and Rhode Island have a long history of voting in similar ways in both presidential primary and general elections. Therefore, there’s not much reason to think that someone will upset Trump in the Ocean State, although the low threshold for proportionality suggests that Cruz and Kasich will get some of the state’s small delegate haul. Prior to 2016, the Indiana GOP only allocated its congressional district delegates in its May presidential primary, with the statewide delegates remaining officially unpledged. But this cycle, Hoosier Republicans will bind the statewide delegates to the statewide winner while awarding congressional district winners three delegates apiece. Much like Pennsylvania, Kasich will hope that being the governor of the next-door state will give him a bit of a boost. However, Trump may well be the favorite, having won much of southern Ohio and the Kentucky caucus, relevant identifiers for southern Indiana. The Hoosier State also has a fairly large number of evangelical Christians, meaning Cruz could contend for some congressional districts. If Cruz is going to make a move on Trump, winning statewide in Indiana would be a good target: In some ways, it is similar to Missouri, where Cruz came up just short of statewide victory. Nebraska’s GOP primary hasn’t been binding in any way since 2000, when it allocated congressional district delegates. But in 2016 the Cornhusker State’s contest will be winner-take-all for Republicans. Having won caucuses in next-door Iowa and Kansas, as well as a large edge in Wyoming’s county conventions, Cruz will have high hopes in this contest. As it’s a closed primary in a relatively small state, it would follow a pattern of small-state, Republican-only wins that Cruz has mostly had outside of his home state of Texas. Though its primary will allocate all of the state’s delegates, the West Virginia GOP will in some ways employ the most extreme version of the loophole primary. While the Illinois and Pennsylvania versions bind their automatic and at-large delegates together to the statewide winner, the Mountain State primary only binds the three automatic RNC delegates to the statewide popular vote victor. The 22 at-large delegates will be elected separately just as the district-level delegates are, with each delegate candidate listed individually with his or her presidential preference. Trump is a heavy favorite in West Virginia, having won the Appalachian parts of Kentucky, Ohio, and Virginia. Unsurprisingly, a mid-February poll found him leading Cruz 40%-20%. Perhaps the real trick for Trump will be making sure his voters back all of his delegate candidates in roughly equal measure regardless of their names, something that may have hurt his delegate haul in Illinois’ loophole primary. The statewide winner won’t get all that much here because all three candidates should receive delegates in a proportional allocation, and there is a very low threshold to qualify for delegates. Allocation method: For CD delegates: If at least two candidates win 20% in a district, the winner receives two delegates, second-place receives one. If a candidate wins a majority or only one candidate wins at least 20%, the winning candidate receives all three delegates from that district. For statewide delegates: Proportional allocation by statewide vote (20% threshold). In 1996, 2000, and 2008, the Evergreen State GOP used a two-step caucus and primary process to determine its delegates, and in 2012, the party opted to solely use a caucus system. But in 2016, Washington State Republicans are using the primary to determine its entire delegate allocation. It may vote similarly to its southern neighbor, Oregon. Many might have expected the Golden State primary to have little clout because of its place at the end of the GOP primary calendar. Instead, with the slow-developing race and the possibility that no candidate might get a majority of the party’s national delegates, California’s Republican contest takes on a great deal of importance. With few statewide delegates because of California’s strong Democratic leanings (thus hurting it in the GOP’s delegate calculation), the major focus will be the 53 individual elections happening in each of the state’s congressional districts. Every one of them could prove critical in Trump’s effort to get over the 1,237-delegate majority hump and in the anti-Trump forces’ push to block him. But it’s easy to see Trump doing well in many parts of the state and having an edge for the statewide vote. Anti-immigration politics, one of Trump’s strengths, has long held great salience in the state’s GOP, most notably support for Proposition 187, which voters approved in 1994 to prohibit illegal immigrants from gaining access to public and social services. Given Cruz’s success in some parts of the West, the expectation would be for him to give Trump a challenge in some districts. One can also imagine Kasich doing well in some wealthy, urban congressional districts, such as those in the Bay Area. For the first time since 2000, Montana Republicans will employ a binding presidential primary, having determined their delegates through a caucus in 2008 and at the state GOP convention in 2012. If it were a closed primary, the Big Sky contest would be right in Cruz’s wheelhouse. However, the open format probably helps Trump’s chances. Even though it’s being held a month after its bigger neighbor, one might expect the statewide results in New Jersey to largely mimic New York. If someone could beat Trump in New Jersey it would probably ensure he finishes short of 1,237, but there’s no reason to think Cruz or Kasich is capable of such an upset at this point. Perhaps a Garden State surprise will become easier — or harder — to imagine as we move into April and May. Much like Arizona, the salience of the immigration issue probably makes Trump at least a slight favorite, though Cruz will surely battle for New Mexico as well. The only polling data in the Land of Enchantment came in mid-February and showed Cruz and Trump essentially in a tie, 25%-24% respectively. With his wins in other parts of the Great Plains/Midwest and in closed-off contests, Cruz will hope to win the Mount Rushmore State. Notes: Closed, semi-closed, and open primaries are based on FairVote’s interpretations. Closed primaries/caucuses generally permit only registered members of a party to vote in a primary or caucus, semi-closed contests generally permit independent or unaffiliated voters to vote in a party event, and open contests generally permit any voter to participate.